Just as most people can remember where they were when the news of JFK's assassination reached them, they can recall seeing images from the moon for the first time. Michael and I were in Cambridge, UK, staying overnight with his parents in a house lent to them by wealthy friends. We left our tiny apartment on Station Road that night so that we'd have access to a television -- something we didn't have until we rented a TV a few years later. 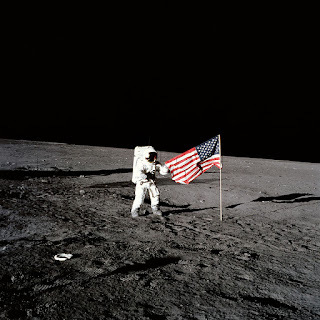 Michael and his mother were serious science and science fiction afficionados, so the night of 20 July 1969 was hugely important to them; his dad, too, recognized this as an iconic moment. And I, the only American in the group? I went to bed. I did ask to be awakened at touchdown (early hours of the morning GMT), but I'm afraid to say I was one of those who felt money for the space program could have been used to fund social programs desperately needed by poor Americans. Now I think I was wrong. Yes, Apollo costs ran to $24 billion, a trillion dollars in today's currency. But it was naive to think that the money saved would have gone to, for example, failing schools. The $111bn Vietnam budget was there to gobble it up, or the inevitable pork barrel projects that seem to be as inevitable as death and taxes. Oh well. Back to the moon. There's lots of coverage, technical and poetic out there. I'm just going to paste in a few of the quirky bits of information that have caught my eye, ending with a comment by the producer of a 2007/8 documentary still making the film festival rounds, She Should Have Gone to the Moon, about Jerri Truhill, one of the women who bested their fellow male astronauts in training exercises. Kudos to all involved, on the ground or in space. Those words have become the most widely known botched phrase in modern times. Armstrong - in missing out the indefinite article before "man" - made a tautological mess of his historic pronouncement, an understandable error given what must have been on his mind. For example, at the Grumman factory in New Jersey, where the lunar module was built, staff would clock off at 5pm, leave by the front door, walk round to the back and work for free until midnight. Similarly, employees at the International Latex Corporation - which made the suits worn by the Apollo astronauts - worked with equally obsessive intensity. In a recent documentary, the company's senior seamstress, Eleanor Foraker, recalled working 80-hour weeks without days off or holidays for three continuous years, suffering two nervous breakdowns in the process. "I would leave the plant at five o'clock in the morning and be back by seven. But it was worth it, it really was." After that, Armstrong and Aldrin spent a couple of hours of the moon, safely blasted their way back to the command module, and headed home in a spacecraft that offered less space, and worse toilet facilities, than a minivan. When the capsule splashed down in the Pacific, the frogman who opened its door was sent reeling by the smell. The job - of hatch-opening after touchdown - became the programme's most dangerous. All of the above from a terrific article by Robin McKie in The Guardian: well-worth clicking on link. The moon landing anniversary has been big news this week. World Service has been running a 'what were you doing when ...' strand, and listening to it reminded me that Zambia has a small, albeit surreal, footnote in the history of space travel. In the 60s a science teacher, Edward Nkoloso, decided that Russia and America shouldn't be the only ones heading into orbit, so he set up a space academy and started training so-called 'afronauts' for a mission to Mars. Apparently the cadets were rolled down a hill in a large drum to prepare them for weightlessness! From the blog our thirty-something London neighbors have set up as a record of the year or two they'll be spending in Zambia. If you want to read some really great stories, drop in to http://zambiaexpress.blogspot.com/. Robin McKie's excellent overview of the Apollo project is a striking story of brave men, technology, money and cold war competitive folly. But the other hidden histories behind the Apollo era involve the women, all great pilots, who were trained by NASA but then ditched in an act of blatant sexism. These women, the Mercury 13, were all selected by NASA at end of the 1950s to be trained for the space programme. Jerri Truhill was the leading light, a glamorous, tough-talking Texan, wife and mother and a superb aviator (she flew perilous reconnaissance missions over Cuba during the 1960s missile crisis). In Ulrike Kubatta's documentary She Should Have Gone to the Moon, Truhill tells how the women outperformed men in all the training tests (including water tank isolation) but how ultimately, the authorities, with the approval of President Johnson, stipulated that they would "rather send monkeys into space than a woman".